LaFevor & Slaughter has received prominent recognition from the American Institute of Family Law Attorneys (AIOFLA) for outstanding performance with their “Two Years 10 Best Family Law Firm for Client Satisfaction” award. 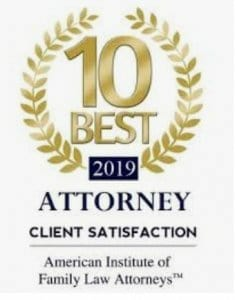 The American Institute of Family Law Attorneys is an independent third-party law firm rating organization that develops and publishes a list of the top 10 family law attorneys and firms in each state every year. AIOFLA’s attorney evaluation and selection process is rigorous and comprehensive. It relies heavily on peer and/or client nominations, extensive research, and the organization’s independent assessment. Clients are able to use this annual top 10 best list as a valuable resource for selecting the right firm for their case. One of the major factors considered by the AIOFLA in the firm selection process for this award is the attorneys’ reputation and relationships with clients. The AIOFLA places significant weight on the track record of attorneys delivering not only successful outcomes for their clients, but also personalized and attentive service and support. Law firms and their attorneys demonstrating the highest levels of Client Satisfaction are superb candidates to make this distinguished list. The experienced and trusted family law attorneys at LaFevor & Slaughter are determined to represent your legal interests in your family law case. We have more than four decades of experience serving Knoxville families with highly competent representation that achieves favorable results for our clients over and over again. We’re very proud of our latest award. We promise we will continue to strive to be the best we can be, and to do whatever is in our power to protect our clients and their futures.